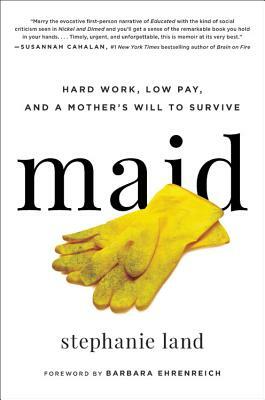 Stephanie Land’s memoir, Maid: Hard Work, Low Pay and a Mother’s Will to Survive (Hachette) is a thoughtful, brave and timely book about surviving homelessness, domestic violence and low wage work such as housecleaning to support herself and her young daughter. Now based in Missoula, she spent many of her young adults years in Port Townsend and the Skagit Valley, then moved to Missoula to finish her degree in Creative Writing. She is now a freelance writer, her work supported in part by Barbara Ehrenreich’s Economic Hardship Reporting Project. “If this book inspires you, which it may, remember how close it came to never being written. Stephanie might have given in to despair or exhaustion; she might have suffered a disabling injury at work. Think too of all the women who, for reasons like that, never manage to get their stories told. Stephanie reminds us that they are out there in the millions, each heroic in her own way, waiting for us to listen.” —From the Foreword to Maid, by Barbara Ehrenreich, author of Nickel and Dimed. “What this book does well is illuminate the struggles of poverty and single-motherhood, the unrelenting frustration of having no safety net, the ways in which our society is systematically designed to keep impoverished people mired in poverty, the indignity of poverty by way of unmovable bureaucracy, and people's lousy attitudes toward poor people... Land's prose is vivid and engaging... [A] tightly-focused, well-written memoir... an incredibly worthwhile read.” ─Roxane Gay. Stephanie Land appears in conversation with Seattle writer Jennie Shortridge tonight. Jennie Shortridge is the author of five novels, including Love Water Memory, and is at work on a memoir. A lifelong volunteer, she is the co-founder and executive director of Seattle7Writers, a nonprofit collective of Northwest authors who raise money and awareness for literature and literacy. Free admission. Co-presented with WeAreOneAmerica.org and HUGO HOUSE.